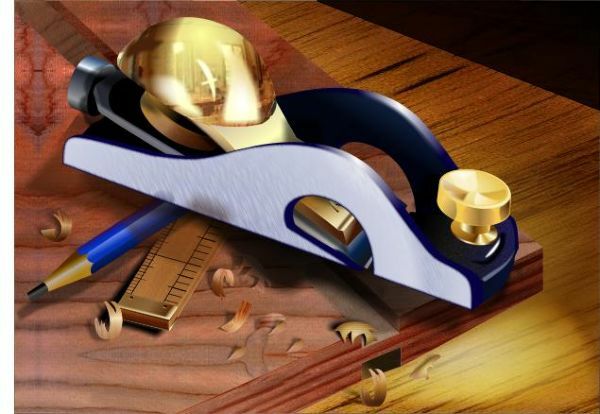 The Block Plane shown here was one of a series of woodworking Illustrations that I did for the Scottish Examination Board as part of exemplar material for Higher Craft & Design students & teachers seven years ago. This drawing along with around 27 others was my first foray into CMYK—Oh the problems that caused me, not having a clue on that subject at that time. Schools at that time were strongly encouraged to use CorelDraw but I hung out for Xara coming from Art Works and the Acorn and many other schools followed suit when they saw how quick and easy it was to use in Scotland.